Last weekend I headed over to Brighton to celebrate my sister’s birthday with her and her mum. Although they were staying until the Monday, I was only able to be there for 24 hours as I needed to get back for the children, but we managed to pack lots of fun into the time we had and I had an amazing time. I had been to Brighton a couple of times before quite a few years ago, but when I came before I didn’t really explore much so it was good to have a proper look round, to walk the lanes and try some food at some of Brighton’s hotspots. We stayed in the most gorgeous Airbnb. It was right on the seafront, only a ten minute walk away from the Brighton Pier and the most picturesque setting. The interior was amazing. An Instagram dream. 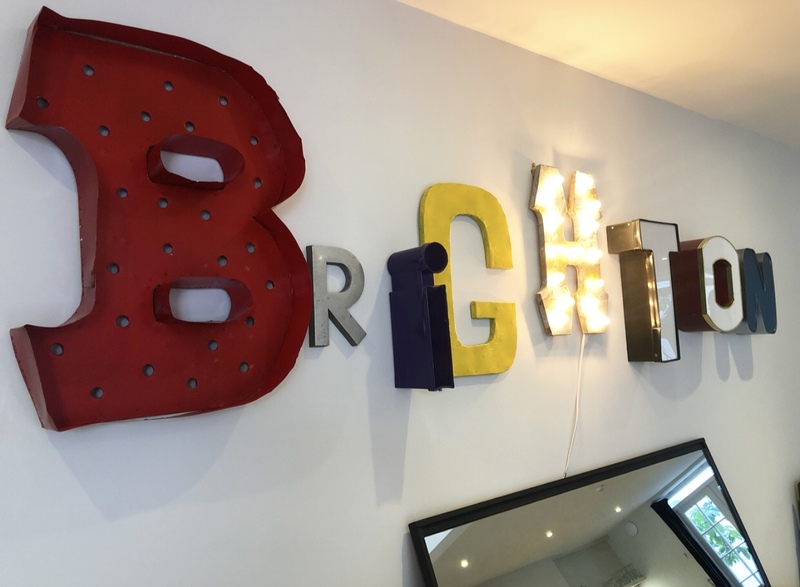 The Brighton sign above the dressing table and the roll top bath were the highlights for me. My sister and I spent a hilarious couple of hours when I first arrived taking about a million photos of each other. Most were total fails but we also managed to get some of my favourite shots ever. The studio apartment was kitted out with everything you could ever need need (apart from a lighter for the birthday candles we had for the cake as we found out) and it even had Netflix set up so we were able to watch My Best Friend’s Wedding in bed at the end of the night – win! We headed out in the pouring rain to visit Fatto a Mano for pizza as my sister had heard amazing things. It was a busy Saturday night and they weren’t taking bookings, so we had to chance it and just turn up. Luckily they managed to fit us in and we were seated overlooking the kitchen area and wood fired oven, which was actually really interesting. The pizza was delicious. I was totally stuffed by the end, but didn’t want to miss a bite and managed to finish it and we shared the Nutella churros which were also amazing. I totally recommend a visit but make sure you are wearing an elasticated waistband! For breakfast, we walked across to town to SIX, which my sister had been told was amazing for those on a gluten-free diet (she has coeliacs disease). The venue is gorgeous. Total Instagram goals and the food was incredible. I honestly don’t think I have ever had a nicer breakfast before. My sister and I were totally greedy and had two dishes each. I had the farmers breakfast followed by the pancakes with maple syrup and bacon and oh. my. word. It was so good! I also had a peach juice, which was totally refreshing. If you go to one place for food in Brighton, make it SIX. Brighton is a bit of a maze and we had fun getting lost amongst the quirky shops, filled with shops selling the coolest items. I wanted so many things but managed to restrain myself and just picked up a card for Cameron, which was perfect for him. I could quite happily spend a fortune if I had the money. I couldn’t go to Brighton without visiting the pier. It was freezing cold by the time we got there, so we didn’t stay long, but it has so much to keep you entertained if you fancy being a total tourist. Have you visited Brighton? Where would you suggest I visit next time I am around?